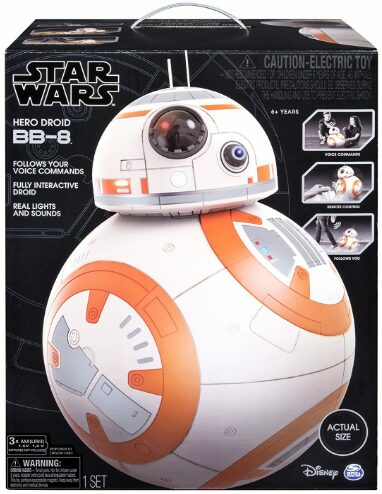 Kids of all ages are interested in Star Wars these days, which make the remote control bb8 toy a great gift. There is a huge amount of Star Wars BB8 themed merchandise available on the market. If you have decided that a remote-controlled BB8 toy is the perfect choice for your child, you may have been overwhelmed to see how much choice is out there. Here, we have reviewed the best RC BB8 toys and shown the key features of each so you can make the best choice for your child. There are more basic options which are an ideal introduction to radio-controlled toys for younger children. Older children, teens and adults may be more interested in the sophisticated app-controlled models. These are impressive toys, which can be programmed to do many different things. There are also models which can be controlled by voice recognition and movement tracking – these are more expensive but great fun to use. 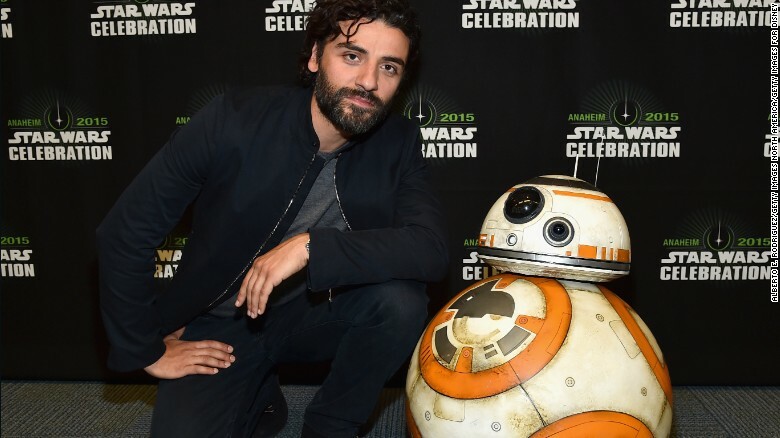 BB8 was introduced to our screens in the Star Wars: The Force Awakens movie. The cute robot was immediately loved by kids and adults alike. His body is a large sphere and his dome-shaped head rolls on top. Many of the toys reviewed here are very realistic – BB8’s body can roll in 360 degrees whilst the head is held on by magnets. Kids of all ages will be delighted to receive a BB8 robot who looks and acts just like their favorite character from the Star Wars franchise. 8 How does the BB8 Toy work? 8.0.1 How does the bb8’s head stay on? 8.0.2 How do you know if your BB8 toy is charged? 8.0.3 What does the BB8 Stand for? 8.0.4 Who came up with the BB8? 8.0.5 Coding the Sphero Star Wars BB8 Toy Droid? It can be difficult to know what kind of BB8 toy to choose for your child – they all differ so much in price and in the features they have. The first thing you should think about is how interested is your child in Star Wars? If they just want a cool remote control toy to play with, one of the more basic models is probably ideal. Similarly if your child is younger or hasn’t got much experience of operating RC toys, they will end up frustrated by a toy which is too advanced for them. If your child is really into Star Wars and BB8 is their favorite character, they will be over the moon with one of the more advanced models. If you are buying for an older child or teenager, or even an adult, they will also be more likely to enjoy the toys with more features. You should also think about how much you want to spend on the toy. Some of the products here are pricey, so make sure your child will definitely appreciate it. Some BB8 RC toys require additional software in order to work. For example, Sphero’s app-enabled toy needs the appropriate app to be downloaded from the Apple Store or Google Play, therefore you need to make sure your device is compatible. This is a fascinating toy for all fans of the Star Wars series. You can ask BB8 to go out on patrol by himself, and he can interact with other Droids! This product requires the relevant app in order to work, so make sure your smart device is compatible. The Sphero droid is so much more than a remote-controlled toy – it is described as a companion. You can watch the Star Wars films with BB8 by your side and it will react to key points in the film. There is the option to experience a holographic simulation of the Star Wars galaxy on your smart device to really immerse yourself in BB8’s world! The toy itself has impressive specs such as a 100-foot range with Bluetooth connectivity. It can travel at a top speed of just under five mph, and features fun LED lights just like the real thing. It stands at around 11 cm high, and is very light. This makes it best suited for older kids and teenagers – it won’t stand up to rough play by younger children. It’s also quite difficult for younger kids to work. The BB8 droid can interact with other Sphero Star Wars droids. This makes it a great choice if you have more than one child, or perhaps dad would like one, too! The Sphero BB8 toy is a fascinating product which would make a perfect gift for kids aged eight and above. If you really want to keep your robot in excellent condition, there is a huge range of protective cases available. Caseling offers a great product specially designed to fit the Sphero BB8 droid. It is waterproof to a small amount of water, and also shock-proof. There is also a small pocket to keep your accessories in, and a rubber handle for portability. This is a great RC toy which looks exactly like the real BB8! It also makes sounds and lights up just like in the movies. BB8’s head can move in all directions, giving it an even more life-like appearance. This RC toy is ideal for kids ages over five, thanks to its easy-to-use remote control. There is one joystick for forwards and reverse and another for turning left and right. Using both together means BB8 can roll in all directions. By rolling around the droid builds up power, allowing ‘hyperdrive mode’ to be activated. This means your child can drive BB8 at maximum speed, which will really let their imagination run wild! The toy is around 10 inches tall and weighs three pounds. 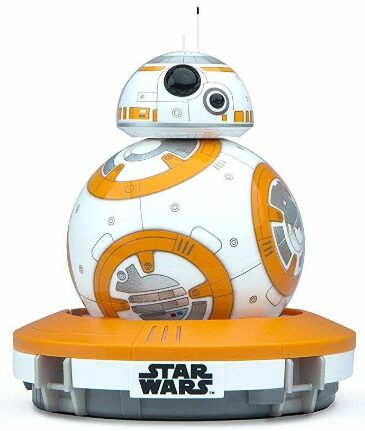 This means it’s perfect for younger children as it isn’t as fragile or difficult to control as some other RC BB8s. It’s great for encouraging imaginative play and is an ideal change from a standard RC car toy for your child. 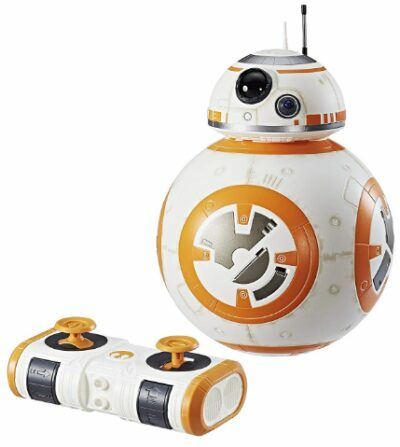 This is a great, interactive BB8 robot toy which can be controlled by a wristband worn by your child. It can also respond to 10 different voice commands – this is a really advanced toy which will give any child years of fun. Kids can send BB8 out to patrol alone, or it can be controlled as described above. The wristband can be used to improve your skills and complete different training tasks. It can also be controlled using the app, like the first product listed here. However, because this one can also be controlled by the wristband, it’s perfect for those who don’t have a compatible smart device. It has a durable polycarbonate exterior which will protect it during missions your child sends it on. Be careful though – when BB8 is sent to patrol, he will bump into objects along the way! You’ll need to make sure it can’t accidentally roll down the stairs, as it isn’t strong enough for this. The Bluetooth connection offers a range of up to 30 meters, which should be more than enough to let BB8 roam around the house. The robot can run for an hour after being charged via its stand. This is a great Star Wars toy for older kids, due to its small, fragile size. This is a great, budget BB8 remote control robot. Whilst it does not have the same interactive features as other products, it still has plenty to offer for Star Wars fans. It is controlled by the included remote and requires batteries – it is not rechargeable. 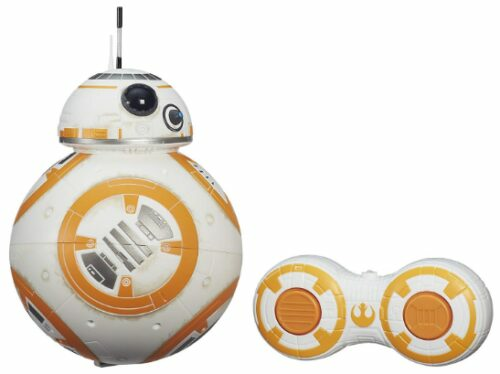 This BB8 toy looks just like the droid from the Star Wars movies and offers fun, realistic sounds too. It works well on any indoor surface, but is better on hard floors or low-pile carpets. The robot doesn’t travel too fast, so it’s easy for younger kids to control. Overall, this is a great BB8 robot for younger children, but older kids and teens might get bored quickly due to its limited features. It is ideal for kids aged four or five up to about nine years old. The remote is easy to use, with just two buttons, making it simple for young kids to learn. If you are looking for the perfect Star Wars toy for a young fan, this is a great choice. It is inflatable, meaning you don’t have to worry about damaging the toy or the house when it crashes into walls and furniture. This BB8 robot toy makes 14 different sounds which your child will love. It is 17 inches tall, making it perfect for young children to control. The remote design is simple, with two buttons making it easy for young kids to learn to use. There is only one frequency available on this toy, so it’s not possible to use two together. The Star Wars inflatable also has parent-friendly features. The sounds can be turned off when the robot is being used if they start to get a bit annoying. It’s also easy to inflate without the need for a pump and doesn’t lose air even after sitting for a while. The toy rolls around realistically just like in the movies – young kids will be fascinated to watch him move around the room. Overall, this is the ideal first Star Wars-themed remote control toy for young children. This Star Wars droid toy is a top of the range product ideal for older kids, teenagers and even adults. It stands at over 16 inches high and can be controlled by voice commands and your movement. It looks just like BB8 in the Star Wars: The Last Jedi film, with its beautifully painted body and realistic sound and light effects. This fun gadget behaves just like the original BB8, loyally following you and obeying your commands. The BB8 droid is capable of having conversations and has many different modes to offer. One of these is ‘follow-me mode’ – attach the remote to your waistband and watch in amazement as BB8 trails around beside you! It can move in 360 degrees on even surfaces – you can take it almost anywhere. This Star Wars-themed robot comes with a wall charger for the body and a USB charger for the head. It also requires three AAA batteries for the remote control. This toy is perfect for kids of all ages – it is large and robust enough to be used by younger kids and they will love to interact with it. It also has enough fun, advanced features to delight older children and adults too. This is an entertaining, interactive toy ideal for younger Star Wars fans. Whilst it is not remote-controlled, the body and head can move and it can roll around. It features over 17 sound effects just like in the Star Wars: The Force Awakens movie. This BB8 robot can move around on a roller underneath its body, working best on hard floors. It also moves its head and bleeps just like in the movies! 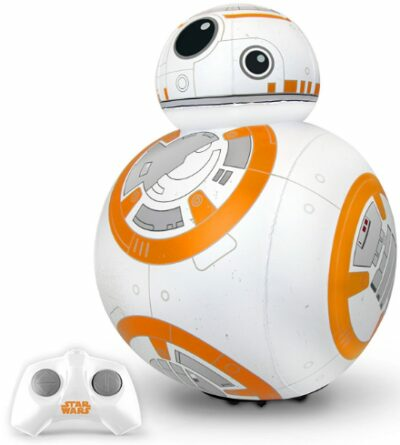 BB8 can be activated either by pressing a button on the toy or by using your voice. It can follow your child around based on their voice – it’s just like having a little pet! Because the toy is interactive and controlled by voice, it is perfect for little kids who can’t use a remote control. Older kids will love interacting with the toy too, and even adults will enjoy joining in. It’s a great choice if you’re not sure if your child will be able to control one of the RC droids. You can even upgrade to a more advanced model once your child gets the hang of this voice-controlled version. 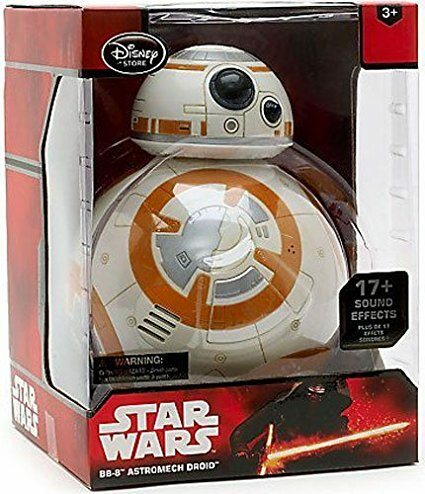 This BB8 toy is a great size and is nice and sturdy, making it perfect kids of all ages. It requires four AA batteries, so why not get some rechargeable ones so the kids can enjoy their toy for longer. When it’s not in use, the toy makes a cute decoration for a desk – it won’t roll off unless it is activated. If you are looking for the most accurate BB8 droid toy available, Sphero’s offering is fantastic. It looks, sounds and moves just like the real thing. Your child will simply love playing with this toy for hours, even as they grow older. If you really want to splash out, it’s well worth spending a bit more to have the version with the wristband. This gives your kids even more ways to play with the robot. This toy is great for teaching your child about robotics and programming, in a fun, simple way. It’s worth investing in one of the compatible storage cases for the Sphero droid if you really want to make it last. They are inexpensive and allow all accessories to be safely stored together along with the toy. If you don’t want to spend a huge amount of money on a BB8 remote control robot, the inflatable version is a great budget pick. It is perfect for younger children and can stand up to some rough handling. The large size and simple remote make it perfect for even the youngest wannabe Jedi’s. The range of sound effects is great and will delight all fans of the lovable robot. The parent-friendly features make this the ideal choice for everyone. How does the BB8 Toy work? When you look at how these BB8 toys move, it is almost unbelievable. We all thought that BB8 was just a cool CGI trick, but the toy proves that he actually can move around like that in real life. But just how did they do that? The answer is actually a lot more simple than we expected. The BB8 unit has a large weight at the bottom to keep the mechanism balanced and a simple set of wheels inside the outer shell that moves it. The outer shell rotates around just like a ball, but the wheels and the engine inside the shell stays in the same upright position. This gives the illusion that the whole robot is rolling around like a soccer ball. It really is amazing what these toy designers can do! How does the bb8’s head stay on? Magic. Pure magic. There’s no other way. Just how does the head stay on the moving ball that is BB8s body? The answer is actually very simple Magnets inside the head and the body keep it balanced in the correct position, and it has either rollers or wheels of some kind on the bottom of the head so it smoothly stays on the body. How do you know if your BB8 toy is charged? It might not be as clear as some would like, but charging and knowing when it is fully charged is quite simple. When you plug in the charger, you should see the blue light on the charger blinking on and off. This is to let you know that the toy is charging. One the battery is completely full, the blue light will stop blinking and turn to a solid blue light instead. What does the BB8 Stand for? Ever since The Force Awakens was released, the internet was full of different crazy theories about what BB8 stood for. We’ve heard some crazy stories, like it was a reference to the band ‘The Beastie Boys’ or that it was in honor of producer Brian Burk. In an interview with Entertainment Weekly, Abrams explained that he simply thought the droid looked like an ‘8’ or a ‘B’, and that there was a lovely and friendly ring to ‘BB8’ so he went with this name. Who came up with the BB8? Apparantly, director JJ Abrams sketched his first idea for BB8 on a simple napkin, just a crude drawing of two circles on top of each other and with an eye in the head. A concept designer working on the film, Christian Alzmann, took this basic idea and developed it into the BB8 that kids know and love today. One thing Abrams was very clear on was that the final design for BB8 had to be different to R2D2 from the original Star Wars movies. 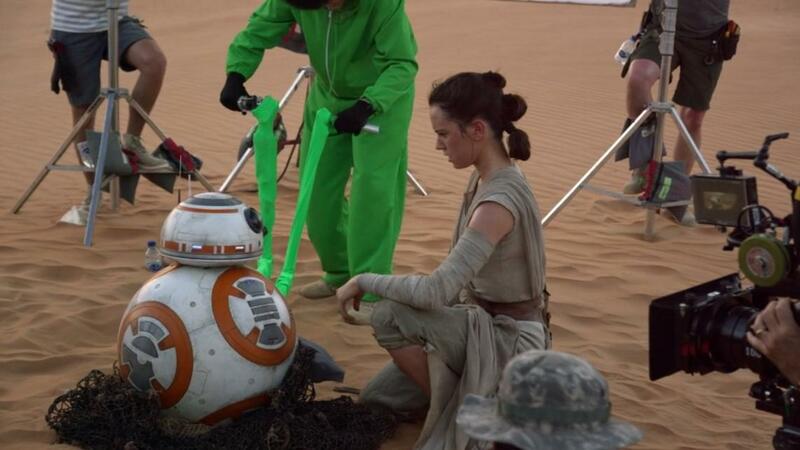 It took a huge amount of effort from the film crew to take the design of BB 8 and make it work onscreen. They actually had to use different versions of BB8 for different shots. It was not until after shooting the film finished that the designers managed to create the life size remote controlled BB8 droid that stunned the world! 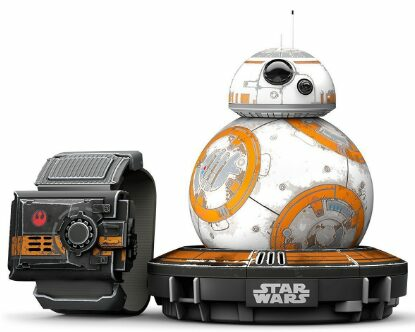 Coding the Sphero Star Wars BB8 Toy Droid? Firstly, before getting started with the Sphero bb8 toy you will need to download the SPRK lightining Lab app which can be found both on iOS and Android, then follow the instructions. The App then lets you have full access to a range of different functions the toy can do, including changing the colors and the lights and even making BB8 race!